It has been another difficult year economically but now it's time to gear up for the holidays and plan for next year. We spend a lot to heat our home, now it's time to come up with a plan to reduce those heating bills. I know you don't like throwing your money away. A family spends approximately $2000 a year for winter heating, this amount can be even more if you do not take care of little things that can increase efficiency of your heating system. The first step you should take is making sure your home is properly insulated. Proper insulation will keep your indoors warm in the winter and cool in the summer. There are various forms of insulation like spray foam, fiberglass, rigid foam and cellulose and many others. Once your home is properly insulated your winters will be more comfortable and you will be saving money on the cost on heating for those cold days. 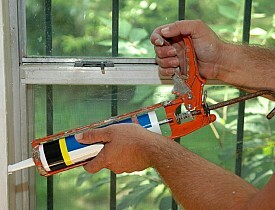 Whether your home is new or old, before winter hits you should check every window and door for air leaks. A leaky home will allow cool air to get inside and warm air to go outside and that will increase your heating bills. Your HVAC system will have to overwork to keep your home warm which will mean more fuel and maintenance expenses for you. Here's a few quick tips to check and fix the air leaks in your home. 2) If your insulation has leaks then use the insulation tape to seal them. 3) If there are rooms in your home that you do not use frequently, make sure to apply sheeting to the doors leading to them. 4) Install vent blocks in the rooms your don't use. 5) Seal all the cracks in the walls. 6) Try to prevent constant running in and out of the house (remember your parents constantly reminding you to stop running in and out of the house when you were a kid?). Everytime you open the door you are letting in cold air and letting out warm air. These are some simple tips that can greatly reduce winter heating costs. You should also call your HVAC company to come in and do a routine winter servicing of your heating system and make sure that there are no leaks in your duct work. Don't forget that lowering your thermostat by even 1 degree will save you money over the long term. I have just installed iStripper, and now I can watch the best virtual strippers get naked on my desktop.